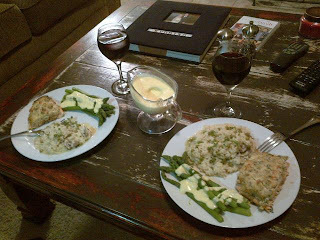 Elizabeth Ann's Recipe Box: Guest Post from PARKER: Date Night in the Kitchen!!!! 1 Guest Post from PARKER: Date Night in the Kitchen!!!! Today, I have a treat for you! I am officially a bandwagon fan. Yes, I have admitted to the worst description a fan could be described as, but ‘tis true. It is not for Tim Tebow, nor for Jeremy Lin, and not even for President Obama despite the latest surge in his approval rating…no, I’m a bandwagon fan of Elizabeth Ann’s Recipe Box. There, I have publically confessed to secretly doubting her attempts to chronicle her adventures in the kitchen. When Elizabeth says she literally started cooking when she and Nate met, there is not even a hint of exaggeration. From the early days of their marriage I had reason to hold to my case, but as the weeks passed and I continued to be the recipient of more and more of her delicious creations, my tune began to change. Two years later I am one of her biggest fans, and for those of you who know her, you can understand why. Now that I have owned up to my shame…and risked the loss of her taking me off the ‘taste test’ list, it is with a clear conscience that I write this guest blog. On November 13, 2010 I was married to the beautiful, Emily Frances Whitty. I still can remember the first time I saw her in Colorado Springs almost five years ago. Despite several hiccups, cough…rejections…cough, I finally prevailed in my attempt to win her heart. Our wedding was a wonderful celebration and one of the best days of my life. Following our honeymoon, we soon realized that several of the activities that we had enjoyed together while we were dating had begun to lose their appeal. Before we got married I had no problem going with Emily to an outlet mall or shopping center to shop with her while she slowly and carefully observed each and every item. My wife is an amazing shopper and finds the very best deal, but it doesn’t always happen in a very short time. Watching her meticulously look through racks and racks of clothes became just short of a form of torture. Moreover, my desire to check ESPN and Aggie baseball scores began to approach rocket launch status. Emily, who once enjoyed attending Double-A baseball games in Birmingham, was now done by the third inning and watching me check my phone incessantly was not helping the situation in the least. Her creative gene began to blossom and nourish itself with sewing, monogramming, decorating and gathering new ideas through magazines and Pinterest. It didn’t take long to realize that marriage is not dating with a sleepover, and our hearts were now pulled to different activities than we enjoyed together when we were dating. Why would it be wrong for me to scroll through ESPN scores before going to bed each night, or for Emily to want to spend a Saturday monogramming? Or for me to want to take her to an Astros game for a date night, instead of date night to shop at Highland Village? Every now and then these events were fine but the underlying issue wasn’t going away and what we realized is that we needed new hobbies that we could enjoy together. After several failed attempts to reach common ground, and meet our monthly budget goals, we finally came up with an idea that has begun to stick. For date nights at home, we started to go through our cookbooks, or Elizabeth Ann’s Recipe Box, to pick a recipe that we had never cooked before to spend the evening making a masterpiece together before sitting down to a movie on our couch. This has brought together several of our combined passions of learning, creating, achieving….and eating. We have loved the time of doing something ‘side by side’ and the joy of spending a great deal of time and effort working together before savoring a fantastic meal. A wise man once said that the mystery of marriage is profound. It is profound isn’t it? Two people, coming together to live as one flesh under one roof, all the while the selfishness and sin of the other person now becomes the lens to view the selfishness and sin that is in you. Many times over the past 15 months I have felt defeated in reaching a common ground with Emily on a variety of situations and issues, including, combined hobbies. Yet, I have seen that it is in the coming together through these conflicts, by the grace of God alone, that our hearts are stirred for Him and each other. I love marriage, not because it is without conflict, but because the conflict points to our inadequacy apart of Christ, and his promise to be with us through it. I love marriage because it is not in our effort that we ultimately come back together but through grace alone. I love marriage not because our love sustains us, but because Christ sustains our love and He is ultimately our greatest treasure and hope. Becoming a great cook doesn’t happen overnight, just ask Elizabeth. 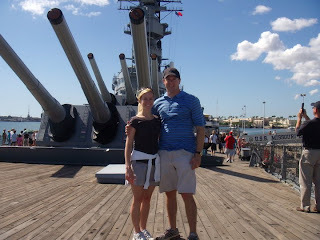 Becoming a great spouse is no different, but in the desire to lose my life and love Emily sacrificially, I have seen a slow change that has produced fruit in our marriage such as creating our cooking date nights. Just ask my chef partner! Below are several recipes that we have enjoyed over the last few weeks from The Junior League of Houston's Stop and Smell the Rosemary. Preheat oven to 350 degrees. Mix mayonnaise, Parmesan, green onions, herbs, bell pepper, lemon juice, salt, pepper, and cayenne in a small bowl. Spread over salmon to within ½ inch of edges. Spray shallow baking dish with nonstick cooking spray and warm in oven 20 minutes. Place salmon skin side down on dish (it should sizzle). Bake 20 minutes or until just flaky do not overcook. Salmon should be medium-rare to medium. Skin should be crispy and may be eaten or removed, as desired. Champagne Sauce: Combine champagne, egg yolks, and vinegar in the top of a double boiler. Season with salt and pepper. Cook over simmering water, stirring constantly, until sauce thickens. Remove from heat and stir. Serve sauce immediately over asparagus. Heat oil in a medium skillet over medium heat. Add garlic and onion. Saute’ until tender, about 5 minutes. Add rice. Stir until opaque, about 3 to 4 minutes. Add ½ cup broth and mushrooms. Bring to a boil. Reduce heat and continue stirring. When liquid is absorbed, add another ½ cup broth. Stir. Continue this process until all broth has been used. When rice is done, remove from heat. Stir in Parmesan and wine. Garnish with parsley and serve.